Minced clams and cream cheese, along with Tabasco and lemon juice, make this a flavorful dip. It's incredibly easy to throw together and your friends and family will approve. It's an excellent dip to serve for a holiday or game day gathering. It's also easy to make ahead of time and pack up and take along to the party. The simple clam dip is delicious as it is, but feel free to add a few tablespoons of sour cream (or more to taste) to the mixture for extra tangy flavor. For more flavor, add some grated onions or onion powder. If you prefer a chunkier dip, double the amount of minced clams. Canned cocktail shrimp make a tasty replacement for the clams or use flaked crabmeat instead of clams. For a flavorful seafood dip, prepare it with all three kinds. For smoky flavor and extra texture, add a few tablespoons of crumbled cooked bacon to the finished dip. If you'd like, add some festive color by stirring in 2 tablespoons of diced red bell pepper or pimiento along with 1 tablespoon of chopped parsley. Some other ingredients that complement clams nicely include chives, curry powder, paprika, and thyme. Feel free to experiment and make the dip your own. Drain the minced clams, reserving 1/4 cup of the liquid. Rub a medium serving bowl with the cut sides of the garlic halves. In a mixing bowl with an electric mixer, beat the cream cheese until it is smooth and creamy. Add the remaining ingredients to the cream cheese along with the reserved 1/4 cup of clam juice. Stir until the ingredients are thoroughly blended. Spoon the clam dip into the serving bowl. For best flavor, cover and refrigerate the clam dip for 1 hour before serving. 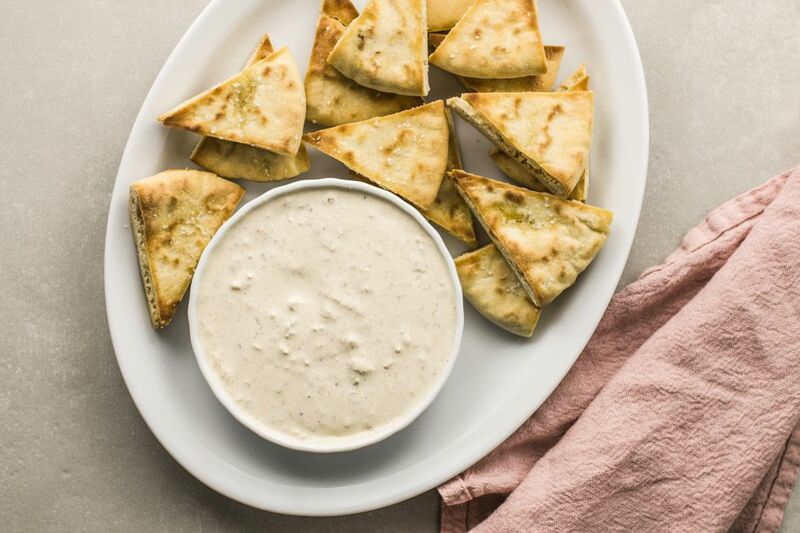 Serve the dip with pita chips, tortilla chips, crackers, bagel chips, vegetable dippers, or toasted baguette slices (also known as crostinis). Pita chips are super easy to make and go well with this dip. To make them, slice two 6-inch pita loaves in half horizontally and brush each round (on the rough side) with about 1 1/2 teaspoons of olive oil. If desired, sprinkle lightly with kosher salt and garlic powder. Slice each of the four rounds into 6 or 8 wedges. Arrange the wedges on a parchment paper-lined baking sheet. Bake in a preheated 400 F oven for about 6 to 8 minutes, or until crispy and golden brown. Cool and store in an airtight container until serving time. If you plan to transport the dip, make sure you keep it cold. The clam dip should not be served at room temperature for more than 2 hours. For extended serving times, consider nestling the serving bowl in a pan of ice.